Check out all the details on the latest issue of the world’s greatest publication, Doctor Who Magazine below! An extensive preview of this year’s sensational Doctor Who Christmas Special, THE SNOWMEN, featuring new photos from the festive adventure, and revealing hints from writer STEVEN MOFFAT and producer MARCUS WILSON. 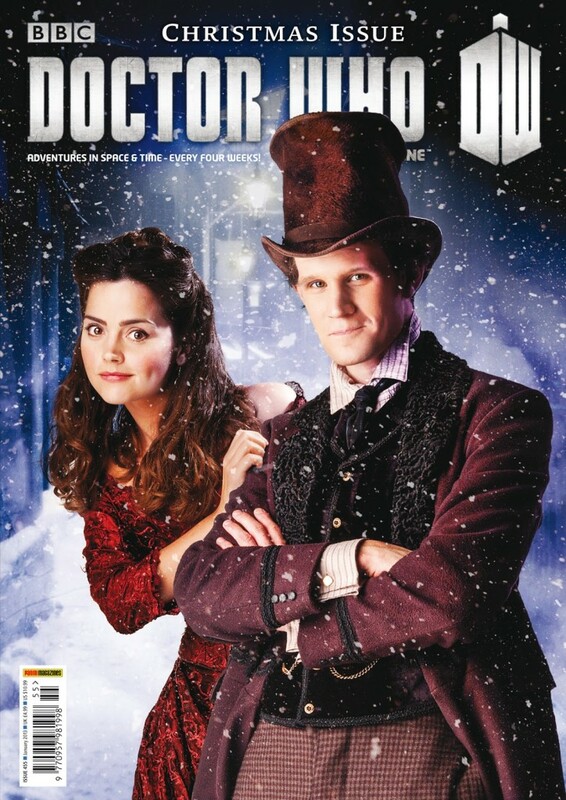 DWM interviews THE SNOWMEN’s stars, NEVE McINTOSH (Silurian warrior Madame Vastra), CATRIN STEWART (Jenny, Vastra’s companion) and DAN STARKEY (Strax the Sontaran) and discovers what it’s like to be part of the Doctor’s Victorian ‘Scooby Gang’! LOOK TO THE FUTURE, NOW! Doctor Who’s head writer and executive producer STEVEN MOFFAT takes DWM readers on an episode-by-episode guide to the next series of eight adventures, set for broadcast in 2013 – only in PRODUCTION NOTES! 2012 brought thrills as well as sadness – and some brilliant new episodes of Doctor Who. DWM turns back the clock to the start of the year to relive the highlights of the last 12 months in THE DWM REVIEW OF 2012. THE EIGHT LEGS OF CHRISTMAS! The Time Team get into the festive mood, travel back to Christmas 2006, and watch the Tenth Doctor have an adventure with Donna Noble for the very first time. What will Chris, Emma, Michael and Will make of THE RUNAWAY BRIDE… ? Christmas is the panto season – and to celebrate this beloved British tradition, the Watcher explores how pantomime’s influence can be found throughout Doctor Who’s history. Oh yes it can! DWM takes a nostalgic look back to Doctor Who’s silver anniversary in 1988, and a season that featured Daleks, Cybermen, creepy clowns and the Kandy Man, in COUNTDOWN TO 50! Next year will be the most exciting time to be a fan ever! But which year has been the best so far? 1983 or 2005? JOHNNY CANDON and TOBY HADOKE argue it out in A BATTLE OF WITS. David Morrissey is THE NEXT DOCTOR! The Fact of Fiction looks back on Christmas 2008’s memorable Tenth Doctor adventure, and talks to writer RUSSELL T DAVIES, who reveals hitherto unknown secrets about the seasonal show. All the latest official news, the latest DVDs, books and CDs reviewed, sneak previews of forthcoming merchandise, a cryptic preview of the new-look TARDIS interior, and much, much more! 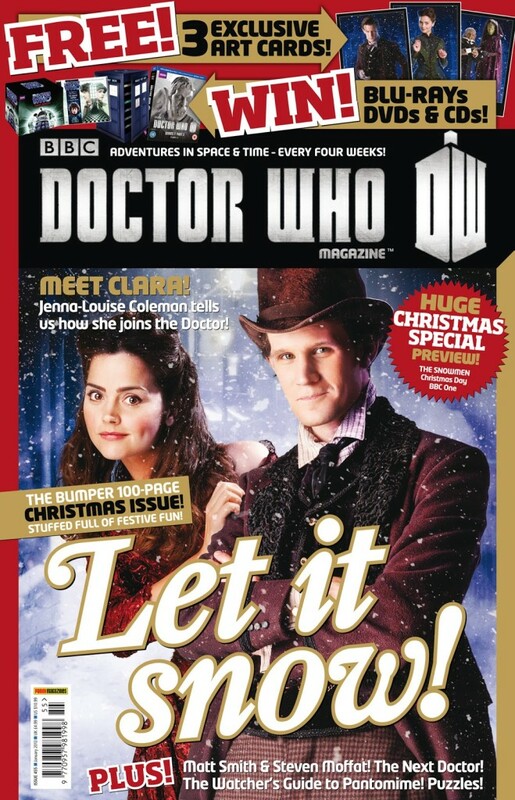 The bumper-sized, 100-page Doctor Who Magazine 455, in shops from Thursday 13 December, priced £4.99!